Can a young man come out, find love, and survive senior year all at the same time? Zach Denham, the editor of a small town high school newspaper, struggles to act like a "normal" guy by dating a female friend. After one disastrous date, Zach vows to spend the rest of his life alone, keeping his true feelings for guys locked up inside. Confident and popular Key Stahl, the school’s newly arrived attractive jock, takes an interest in the innocent young man that goes beyond friendship. 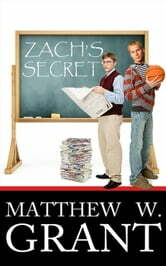 Key soon forces Zach to confront the truth about his sexual identity. Friends will become enemies when an explosive issue divides the school community. As Mrs. Trevott, Zach’s trusted and sharp-tongued English teacher, advises, some of them will stand up for what they believe in even if they are standing alone. Voor middelbare scholieren wel leerzaam. Coming out is ook nu nog niet zo makkelijk als het lijkt.